Typing on a keyboard without a wrist rest may result in an upward bend of the wrist. This contact stress may irritate the tendons and sensitive nerves in your wrists. The longer your hands are bent in this position, the greater the irritation. • Place a gel pad in front of your keyboard. Your hands should be elevated and add more comfort when typing. Your hands should move freely and be elevated above the wrist/palm rest while typing. 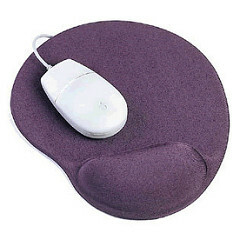 • Elevate your chair so your wrists rest comfortably on the gel pad or “hang” above the keyboard. • Use gel pads for both keyboard and mouse.